On a summer day about a month before Chinese authorities revealed explosive bribery allegations against the British drug-makerGlaxoSmithKline (GSK), a woman in south-western Guizhou province walked into a hospital with her husband. After a routine gynaecological exam, doctors prescribed her £20 worth of Chinese medicine, some with controversial ingredients. The woman and her husband demurred, but – at the doctor's insistence– ultimately handed over the cash. "There were a lot of people in line to see the doctor, so the doctor put a lot of pressure on my wife, saying that she'd better quit resisting," the man wrote on Sohu Weibo, a popular microblogging service, under the username "Grassroots is Grassroots". He reached out to online experts for advice; of 164 commenters, many concluded that he'd been swindled. "Right now, most doctors [in China] are just as shameless as corrupt officials," wrote one. Last week, Chinese security authorities reported that GSK executives admitted to funnelling bribes to Chinese doctors and officials through 700 travel agencies and consultancies over six years. The Guizhou man's experience illustrates the ubiquity of such malfeasance in China's healthcare system – and the widespread outrage that it's caused. Hospitals that are ostensibly government-funded are so cash-strapped they must rely on drug sales to remain afloat and doctors frequently overprescribe medicines to supplement their meagre incomes. Patients end up paying inflated prices for drugs they often don't even need. The fallout from the GSK case is ongoing. Chinese authorities have detained four senior GSK executives and barred its vice-president for finance in China, Steve Nechelput, from leaving the country. In return, GSK has sent three top executives to China to deal with the crisis, including its head of emerging markets. GSK isn't the only multinational drug company in Chinese regulators' target sights however. On Thursday, authorities visited the offices of the Belgian drug maker UCB seeking information on compliance. The US-based Merck and Japan's Novartis are also being investigated as part of a price-setting probe announced last month. Yet analysts say because these companies hold themselves to international standards of quality, their malfeasance pales in comparison to local competition. "GSK and other multinational companies like Pfizer, their behaviour in Chinese markets is actually pretty good," said Stanley Li, an independent expert on drug fraud in Beijing. "As for local Chinese manufacturers, their behaviour is much, much worse. They don't even use travel agencies – that's why the policemen cannot find any proof. They just give kickbacks directly, in cash, to Chinese doctors. "Why they don't get punished? One reason could be that local governments cover these Chinese manufacturers, simply because they don't want to lose their investment and tax revenue." On 17 July, China's state food and drug administration announceda nationwide six-month campaign to clean up the country's healthcare system, primarily to tighten industry regulations and rein in illegal online drug sales. "A crackdown on commercial bribery by multinationals is deeply significant to safeguarding the order of the market economy," said a commentary last week in the People's Daily, a Communist party mouthpiece. Some experts doubt the real reasons behind the crackdown are quite so lofty. One western expert on China's healthcare system said health officials may have deemed GSK arrogant for exporting its drugs at artificially inflated prices. "For drugs, especially oncology drugs, there's this huge inflation of costs," said the expert, who requested anonymity to avoid reprisals from drug companies. "I think what's happened is the government said, 'we want to have these drugs, and you will give them to us at a decent price'." The government's efforts to develop and fine-tune its $350bn (£230bn) healthcare industry has, by some metrics, certainly paid off – the country's life expectancy has risen by nearly a decade since the late 1990s; infant mortality has halved. And some 95% of Chinese people receive a form of insurance coverage, up from 30% in 2003. These improvements have not eradicated corruption, but caused it to follow new contours. For example, government health insurance only subsidises treatments up to a ceiling, but if the patient's costs break the ceiling, they must pay the difference. Chinese authorities have reasons to fear a backlash. According to official statistics, there were more than 17,000 "incidents" aimed at hospital staff in 2010, many of them attacks on doctors by disgruntled patients. 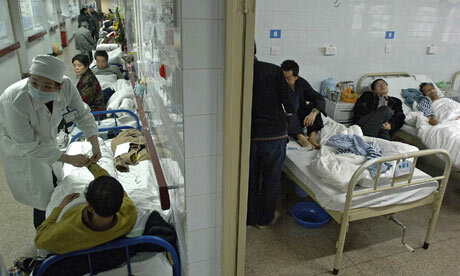 In 2006, 2,000 people rioted outside of a hospital in Sichuan province after a three-year-old boy died from ingesting pesticide. Doctors had refused to treat him because his parents didn't arrive with cash in hand. Some analysts say periodic corruption crackdowns are an understandable, yet ultimately insufficient, tactic in cleaning up the system. China executed chief drug regulator Zheng Xiaoyu six years ago for accepting bribes to approve fake drugs. The GSK case shows how little has changed. "Right now everything in China is changing because the economy is growing so quickly," said a doctoral student in oncology at one of China's top medical universities who also requested anonymity. "When something grows extremely quickly, well – you can say it grows like a cancer. And what do you do when you find a cancer? Well, you need to cut it out."